Your local building code my differ but most recommend the water running through the downspouts of your house discharge the water at least six feet away from the house’s foundation. 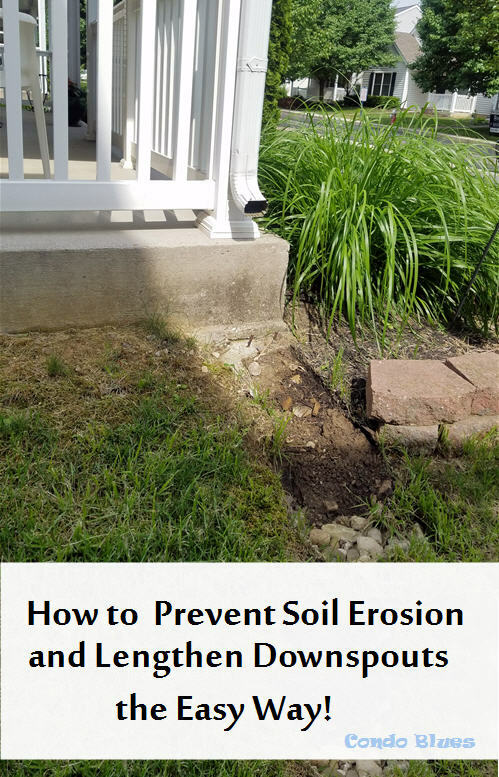 Otherwise, the water can splash back and erode the soil around the downspout where rain water can get in to damage the foundation of your home. 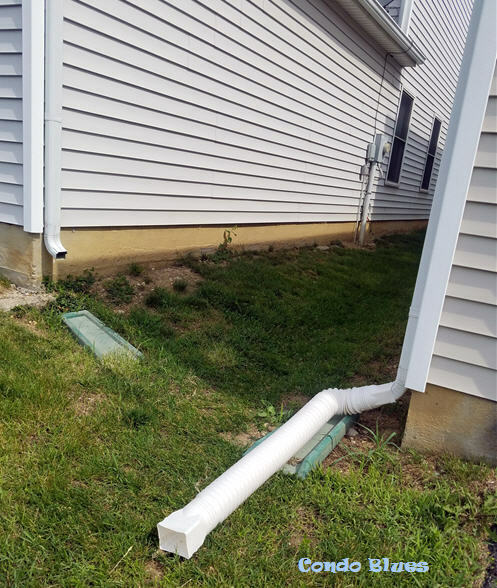 Putting a splash block under each downspout is the easiest way to divert rainwater away from the foundation of your house and fix the problem. That’s what the builder of my neighborhood did to our houses. The results are hit and miss because the builder used a one measurement fits all approach and some of our downspouts are too high due to hills in the neighborhood and some of us have soil eroding under their splash blocks like my neighbor’s house shown below. 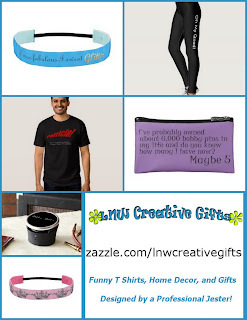 Pin this tutorial on Pinterest for later and share it with your friends! 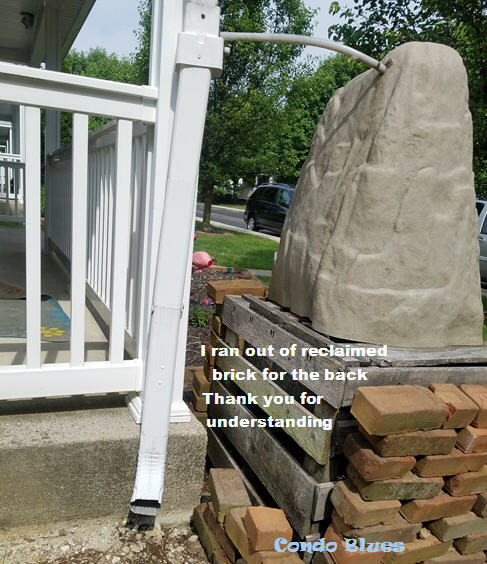 I installed a rain barrel that looks like a giant rock garden ornament on the similar corner downspout of my house to deal with water pooling in the yard due to a French drain my Home Owner’s Association doesn’t want to repair. 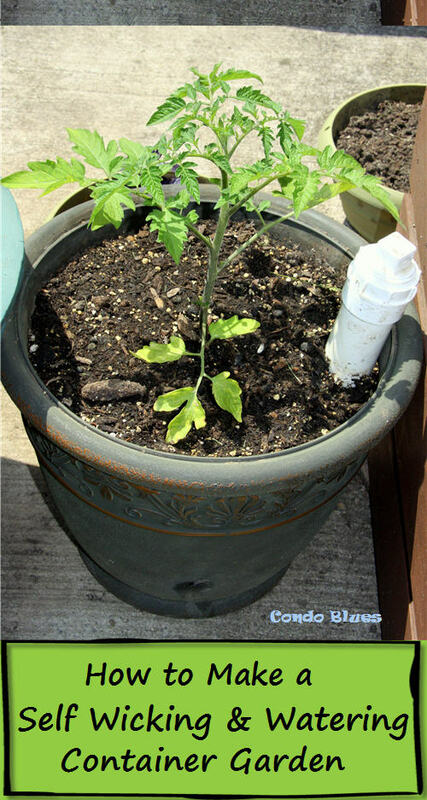 The rain barrel also helps keep soil erosion to a minim due to the downspout elbow being too high off the ground – unlike the soil situation on the back corner of my house. This guy came loose from the rain barrel in a storm. Time to put it back where it belongs and better than before! Instead of buying a new 10 foot aluminum downspout to repair two corners of the house and throwing most of it away, I chose to keep the original downspouts add extensions to make them longer. A 5 to 15 minutes fix verses one that takes hours out of my day? 7 x 1/2-Inch Gutter and Stovepipe Assembly Screws – save yourself some heartache and buy self tapping screws like these. 1. I didn’t have to remove the lower portion of my rain gutter and elbow from the rain barrel diverter because a thunderstorm did this step for me. Depending upon your situation, you might want to remove the bottom elbow (spout) from your downspout or remove the lower section of downspout from your rain barrel diverter. 2. Use the gutter crimper tool to crimp each side of the aluminum rain gutter to allow the pieces to slide one inside the other. 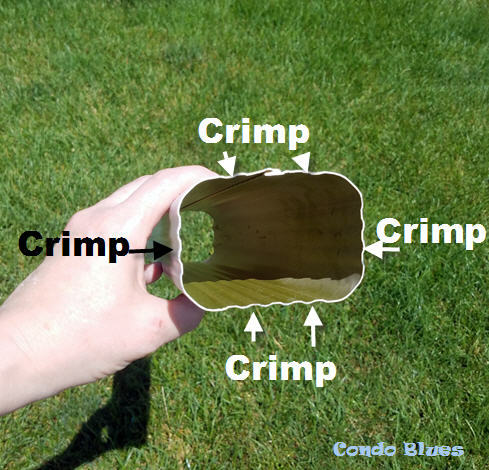 Crimp the flat sides only. don't crimp the corner sections! 3. 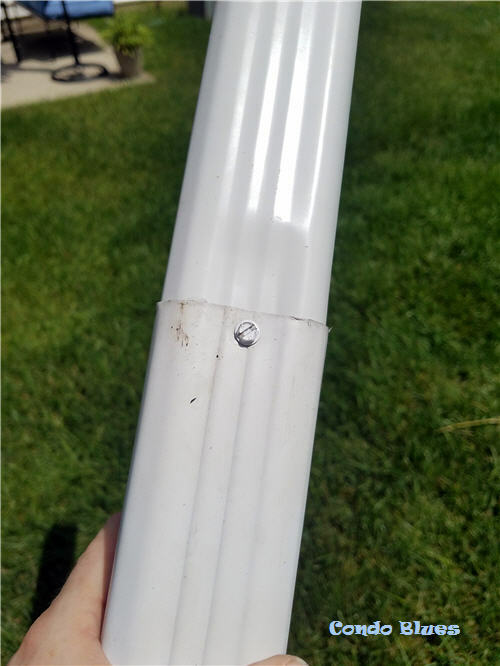 Slide the crimped end of the rain gutter extension into the rain gutter and hold them in place using the screws and screwdriver. Self tapping screws are your friend here! 4. Use screws and screwdriver to attach the new gutter and elbow section on the rain barrel diverter and to the side of the house. I used the original downspout strap and rain barrel diverter since both were undamaged in the storm. I also used the original downspout brace. Try as I might the downspout likes to lean toward the rain barrel instead of straight up and down. I guess they are BFFs. 5. 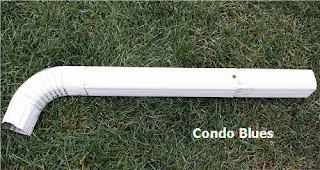 Finally pull the the flexible downspout extension to your desired length and snap it onto the elbow at the bottom of the newly extended downspout. I added a flexible downspout extension to the newly extended downspout in the front of the house. I made the back downspout longer by just adding a flexible downspout extension to it. As you see from comparing my downspout to my neighbor’s the splash blocks on this corner of the house weren’t cutting it. My neighbor has so much rain water erosion his splash block is sitting in a rut under his downspout. I recommend using a flexible extension because it allows me to divert rainwater at an angle toward the drain in the street and not straight into my neighbor’s house.